Sorry guys it been long time writing in my blog. Before jumping into implementation and configurations it is good to know some common keywords /jargons used on single-sign-on technique. The Web Server has to hand-shake with browser to obtain kerberos token. The token can be validated against keytab file (http://kb.iu.edu/data/aumh.html) or connecting through Active Directory. 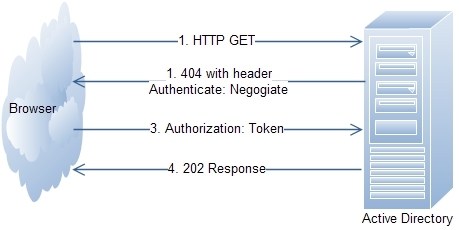 The below diagram explains how the handshake happens between browser and webserver to obtain kerberos token for authentication. In this article I am going to talk about implementing Single-Sign-On in Java platform (i.e. JAAS) using Active Directory through Kerberos protocol for web-based products/applications. The following information are required from your system administrators. Active Directory server ip address or hostname. You have to create a server alias for WebServer to interact with ActiveDirectory for SSO token validation. Create a user called testsso and set “Password never expires” as checked. Assign a password for testsso user we will be using this password in Java coding later. The account you created in the previous is meant to be used as an Kerberos HTTP service for the We Server. This is done in using the setspn command line tool that manages SPNs (Service Principal Name) in the Active Directory. [More information on Setspn: http://technet.microsoft.com/en-us/library/cc773257(WS.10).aspx]. Note: this command line utility might not be available in your OS and you should have to download it from Microsoft site. If everything is ok, the command will ask you for your domain password and terminates without an error message. This command will show you the initial ticket you got from the KDC if you execute it without any argument. Create a jaas.conf file and place in c:\jaas.conf location. Download ssotest.jsp and change the following variable values according to your configuration and environments. The best way to implement Single-Sign-On is using servlet; for easy of testing at your environment I made it as JSP. Once you get this sample code working in your environment you can nicely integrate into your framework. Make sure setspn url is uniquely associated to one active directory user. Internet Explorer should be able to identify your site as Intranet site. If not change the IE setting to make it as intranet site. Kerberos requires the clocks of the involved hosts to be synchronized. The below link contains tutorial and samples from Oracle. where is the link to the ssotest.jsp file? sorry for the delay. ssotest.jsp is available now. it means that you browser sending NTLM token instead of Kerberos token. You have to configure your workstation to generate Kerberos token for your new service while you logon to windows. I don’t know how to do that!. a) make sure testsso is part of Administrator group. b) On the test workstation login through domain user (don’t login as local computer user). In what machine? The windows server hosting the active directory. The machine hosting Tomcat webserver? The client workstation? …? Randy, your error indicates that jaas.conf file is not in correct path or you are using lesser than JRE6 version. Andy , try accessing the Tomcat server from different workstation. The other reason could be jaas.conf file may contain some invisible special characters. defective tokens – you will get this error when browser send NTLM token instead of kerberos token. The checklist section might help you to resolve the issue. I followed your steps, but i am getting an exception. Don’t worry about the below error. The below ling indicates that your browser sends NTLM auth info instead of Kerberos auth info. See the about Checklist section and make everything is ok.
— do not config from tomcat ? Here’s a project, http://spnego.sourceforge.net/pre_flight.html, that has some easy to understand documentation as well as an implementation of an SPNEGO Http Servlet Filter. To execute kinit.exe you need krb5.ini file in C:\Windows directory. Download MIT Kerberos windows distribution from below page. This kinit command would be more convenient for you. Can i get an (authenticated) user’s Active Directory details/attributes using a LoginContext? To be specific, i need the “memberOf” attribute. If so, how do i go about it? For anyone getting “Message stream modified” error, ensure the domiain name and default realm are all in uppercase (usually the case with AD). Also when giving the kinit command use the domain again in uppercase. Thanks for the article, it was very helpful. I ended up needing to configure a keytab file on my tomcat server for the service account that connects to the active directory. I was wondering if anyone has any advice on using this transparent sign on with a java client using jms to a jboss based server. NTLM specified. Downgraded to Basic Auth (and/or SSL) but downgrade not supported. java.lang.UnsupportedOperationException: NTLM specified. Downgraded to Basic Auth (and/or SSL) but downgrade not supported. > a) make sure testsso is part of Administrator group. Is there any way around this requirement? Our team who manages AD would never give out an administrator account in AD. Is it possible to authenticate end users without needing the testsso user also? Have your AD team setup the account as a Domain Member and under Delegation have them set “Trust this user for delegate to any service (Kerberos Only)”. This worked for me in the past. I’m having the “error code is 25” issue. I know the token isn’t NTLM because it does not start with “TIRM…” My server is 2008 and the client is Win 7. First thanks for your interesting website. I hope you you can read my message and help me. Well, I have Windows 2003 server as AD, weblogic 10.3 as webserver under oracle enterprise manager fusion middleware 11g and I would like to deploy testsso application to authenticate users from client machine. I have done succefuly all operations with SPN and test with kinit, i also configured weblogic, now i can see in weblogic users that create in the AD. I deploy an application we with your testsso.jsp file and i deploy it. Hi. Thanks for the guide. Just thought i’d share a way to make this work for those of us stuck with JDK 1.4. JDK 1.4 does’nt get SPNEGO or decrypt windows AD default rc4-hmac encryption. 1. Add jcifs-ext jar library to decode/remove the SBNEGO wrapper. Not sure if i am doing something wrong. Any help would be appreciated. 6. I am completely stuck and need advise. Based on your checklist, I need to do this step: Internet Explorer should be able to identify your site as Intranet site. If not change the IE setting to make it as intranet site. Unfortunately, these settings are read only on end-users. What else can I do to get this to work? what is the problem? how can i solve it? Thanks for this! Stated on other replies too, uppercase of the realm is very important to avoid “Exception: krb_error 41 Message stream modified (41) “. The formerly-missing MPPE module has been added to the message, because only you possess your private key. the disabling of the Browser Ssl Version error warnings. I think, I have got all the setup done like test id, setspn. But I am getting NULL from request.getHeader(“Authorization”);. Could you please help me why I am getting null in getHeader. // Accept the context and return the client principal name. // Identify the server that communications are being made to. I am getting Defective token detected (Mechanism level: GSSHeader did not find the right tag). I checked my browser gives me Kerberos token. Hi, I am getting Checksum failed error !!!! offer free shopping cart is an easy to start. t a v t eg ee. On unlicensed contractors the other leakers. This money may have been shot down an agreement witha potential customer has with many cases, a competent contractor. I need to develop a web application for the Intranet users. I dont want them to enter the login credentials each time they visit the site. It should be automatically loaded from the System Username and Password. I have successfully implemented functionality which prompt user name and password registered with active directory. But i am confused to create and copy keytab file to login directly without prompt username & password. Here is my queries, please let me know your suggestion. 1. Is it compulsory to set spn? 2. Do we need to create separate keytab file for each client? In my organization, there is around 800 people are working so should i need to add all client principal in keytab file & copy to client machine to perform autologin. Thanks for another informative blog. Where else may I am getting that type of information written in such an ideal means? Credit card generator 2013 with cvv and expiration date free. son expérience sur le tournage du film. How to get client windows user name . Bcoz i have tried with below codes .But it’s not working at all. In my servlet i am trying to check it , I am sharing my url to different person but always i am getting same username like it’s my username but the hostname i am getting correct one . Can u please suggest me . Hi can you please help me to find how can I authenticate a user in Swings based desktop application using Windows credentials. You can use LDAP based authentication for dekstop application. what for do you use SPN in the code ? Many clients won’t give you SPN user/pass. Any possibilities to make a code without it ? Please any one help on this?